What is Quickbooks 2015 Certification? Quickbooks is an online and offline computerized bookkeeping and accounting software which purpose is to automate the complete accounting cycle of an organization which starts from generation of an economic event between two parties, moves to generation of vouchers and invoices and then ends up with preparation of financial statements and finalization of accounts. This software is specifically address the bookkeeping and accounting issues of small and medium enterprises. However, its benefits and uses are not limited as corporate clients can also adopt Quickbooks for controlling their accounts and accounting procedures. Quickbooks combines variety of accounting processes into a user friendly system with effective graphical user interface. Apart from automating the bookkeeping and accounting affairs of the business, Quickbooks also provide ease in financial reporting and hence for forecasting and financial projection of the business. It has also the flexibility in customization of the software as per requirements of the users and organizations belong to different industries or sectors of the economy. Computerized accounting is now a much demanding field in all industries and businesses. Increasing the rate of technological advancement and rapidly changing business environment with use of computers and smart phones has increased the demand for utility and business soft-wares such as Quickbooks (for bookkeeping and accounting purposes) and relevant certification holders who are equipped with these skills. Researches in the past has already initiated the increasing rate of bookkeeping and accounting skills in computerized environment that are becoming more relevant and important in the arena of accountancy, taxation and management costing. It’s good that a person is having the entitlement of CA, ACCA, CIMA or such programs but need and skills regarding computerized bookkeeping and accounting soft-wares like Quickbooks is key to success. By keeping in mind the needs of business world, Brainmeasures has introduced Quickbooks 2015 certification program in the field of bookkeeping and accountancy to equip you with the required skills of computerized accountancy. Quickbooks 2015 online certification from Brain measures will provide you a competitive edge in online and computerized accounting systems of the businesses where focus is to outreach the services beyond physical boundaries of the nations around the globe in terms of training and managing your all related activities in efficient and easy to use system. Apart from the course mechanics, learning and competencies of candidates developed through the course material and Quickbook software will be assessed through an online exam and series of quizzes or assignments with practical applications and case studies. This will be definitely an added skill and plus point to improve your CV and will make it easier to get the desired job that requires you to become proficient in computerized accounting soft-wares. Entitlement of Quickbooks from Brainmeasures entitled you a verified and computerized accounting system professional as well as expert in hands on using the other computerized bookkeeping and accounting packages similar to Quickbooks. After getting Quickbooks 2015 certification of Brain measures, you will be able to advance your career by improving your ways of earnings and designation. The average annual salary for those who hold key positions in accounting and finance fields is expected around $40,000-$80,000 per year and this amount may vary significantly based on the type of industry (i.e. IT, Telecom, Banks etc. ), nature and reputation of the organization, location, education, skills and experience of the candidates etc. 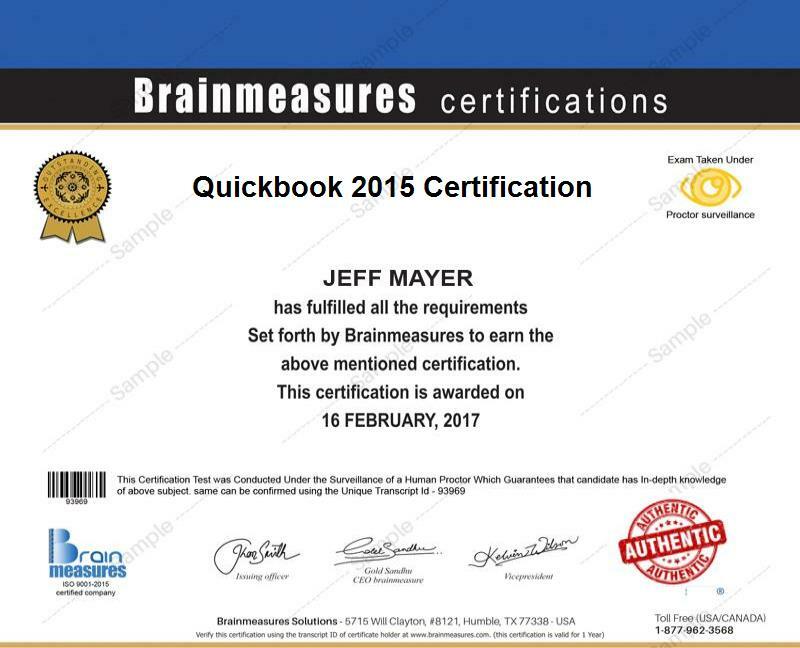 Quickbooks 2015 certification from Brainmeasures is an exceptional certification in terms of providing the knowledge and skills regarding computerized accounting system. Scope of this certification is very wide and prevails to lot of industries. Beneficiaries of the certification can be from IT industry, manufacturing or service world as well. Quickbooks 2015 certification course from Brainmeasures is exclusively designed for bookkeepers, accountants, data entry experts, ERP specialists, accounting and finance managers, cost and management analysts, auditors, chartered accountants, entrepreneurs, small business owners, accounting and finance students, professionals and for all those individuals who wish to enhance their computerized bookkeeping/accounting and management skills in the field of accountancy.